China here we are! 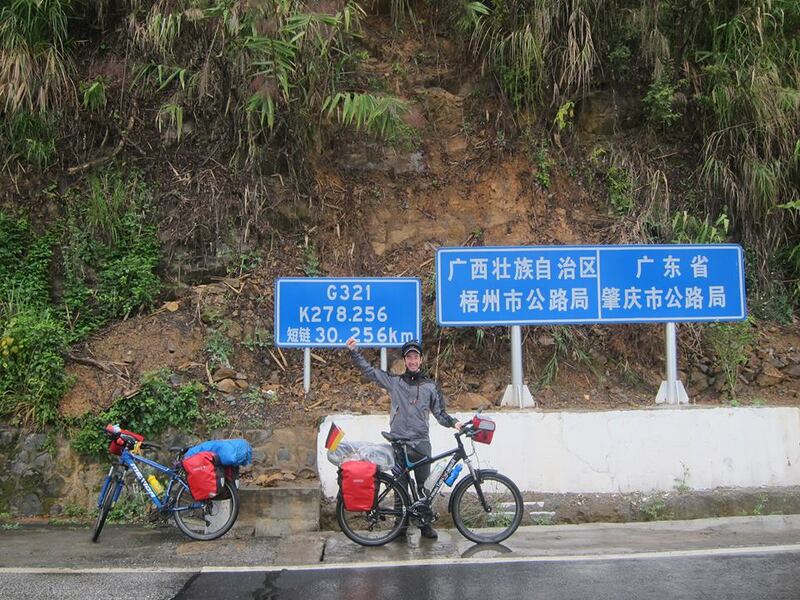 We already cycled around Taiwan, but this here was the real start now – no place we could call home in between. 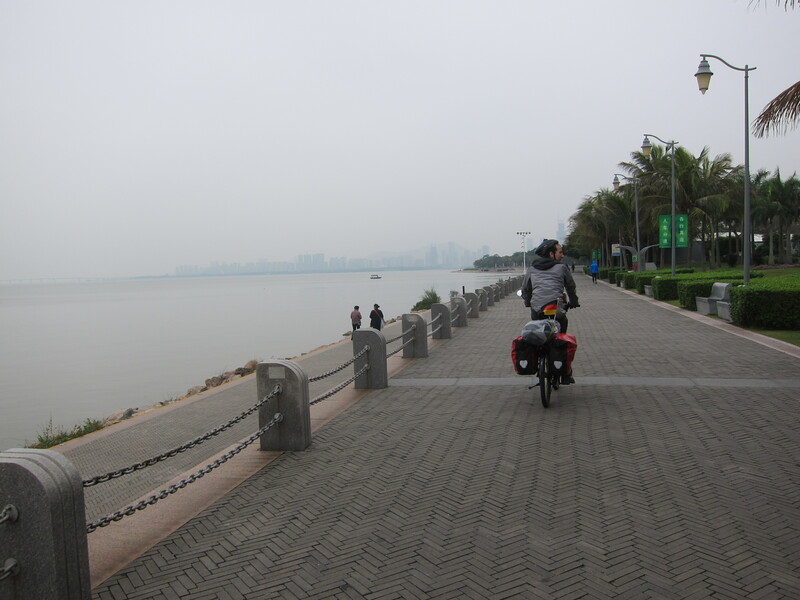 We only had to go to Zhuhai, across the bay today, as I figured the border and ferry crossings would take up most of our time. 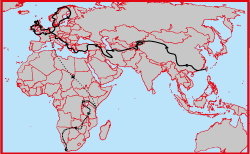 There is a direct ferry from Hong Kong, as well as from Shenzhen. Since we stayed in the northern part of Hong Kong, and since the Shenzhen ferry was much cheaper (RMB120), I figured this option might be better. 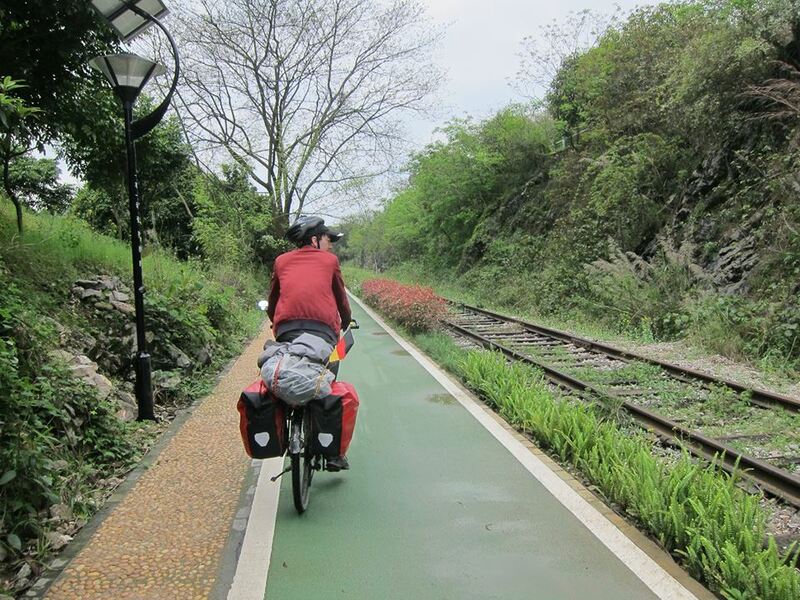 To cross the border, we still would have to take the MTR for one stop – this is the only way to bring a bicycle across, the roads being for motorized traffic only. We actually removed the front wheel this time, which made hauling the bike around a huge pain. As soon as we exited the train they came back on again. 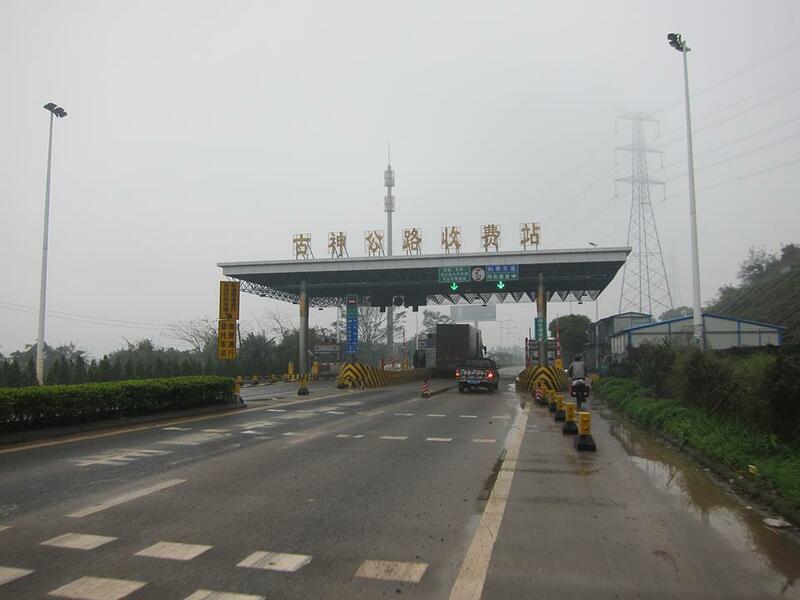 We crossed the border without big troubles. What immediately surprised me is that I heard Mandarin everywhere. In Hong Kong, Cantonese is THE language, and I imagined this to be the case for the whole Guangdong province. I was wrong. Out we were in the mainland. I quickly exchanged my remaining HK$ and set out to get a SIM card. I was quoted RMB150 plus RMB200 for 1GB of data. Excuse me? Not even in Germany you pay this much. I quickly gave up and postponed the matter for the day. Now we could go out and ride, it was about 28 km to the ferry port. 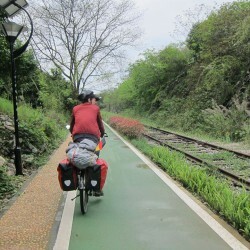 Our HK hosts already told us this, but I was still surprised that we could follow awesome bike lanes for most of the way. 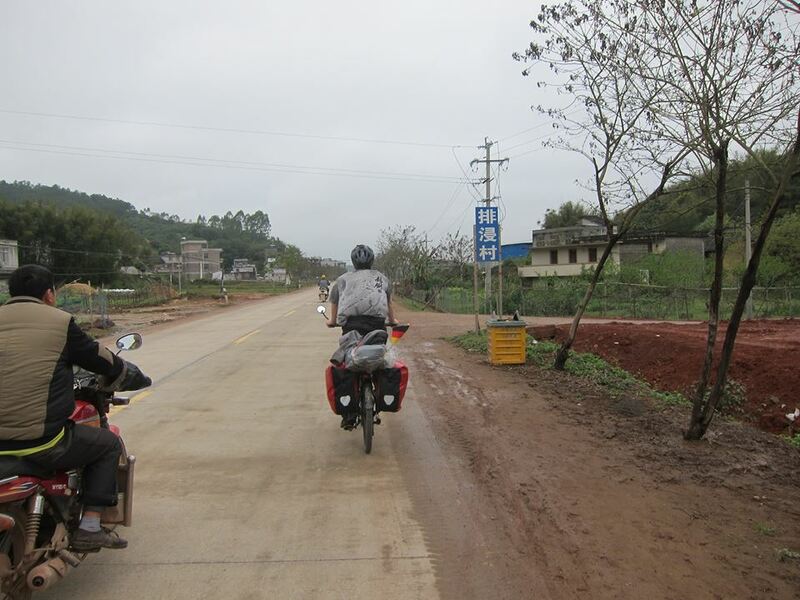 None of the Chinese traffic would bother us. 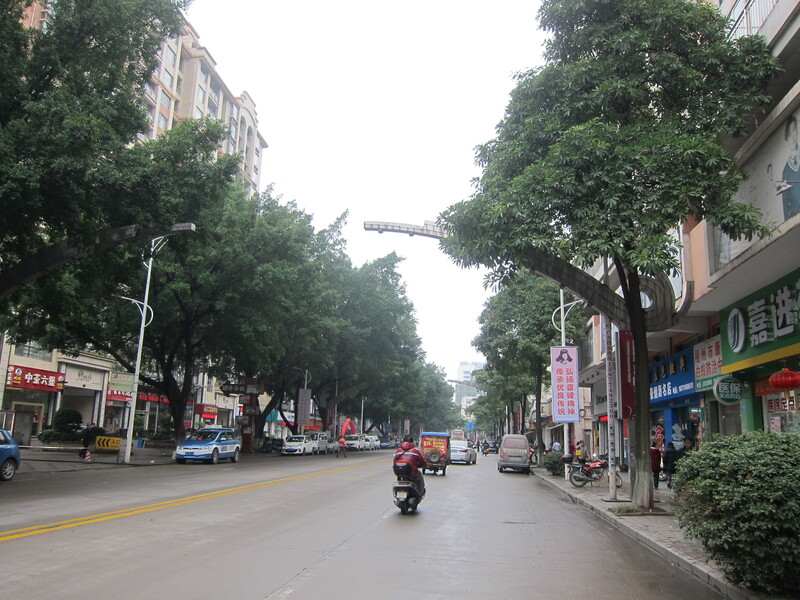 Another thing that surprised me was how modern and clean Shenzhen is. 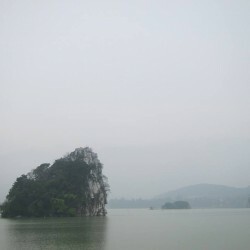 I mean, I knew beforehand that it’s one of the most booming cities in China, but it was really on par with Hong Kong. We reached the ferry port just in time for one of the departures, and Yuily went to get the tickets. For the whole time we’ll be in China, I’m going to be really glad that she is there – she is able to communicate with basically everyone in Mandarin while I can only wait. I should’ve learned more while I was in Taiwan. 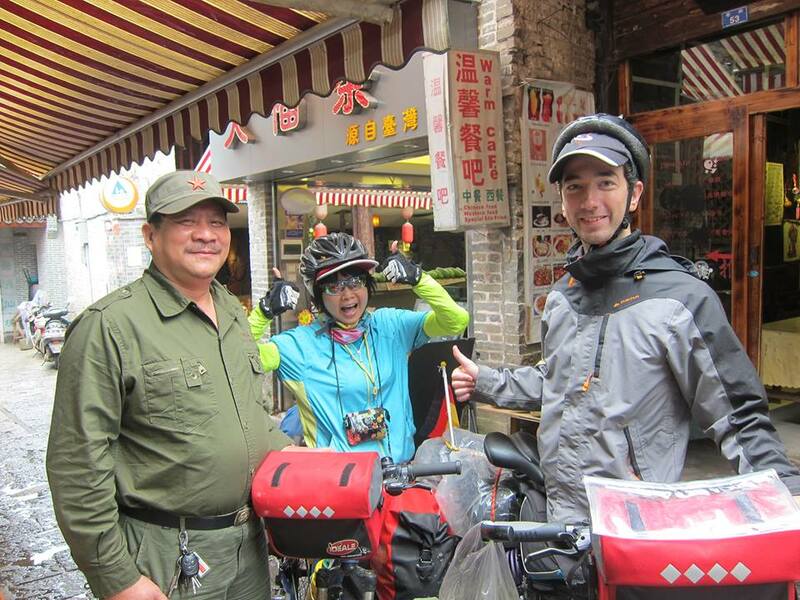 After we got tickets, we got told during boarding that we had to pay a bicycle fee of RMB20 each. No big deal, Yuily quickly got the extra tickets. Thanks to her again. 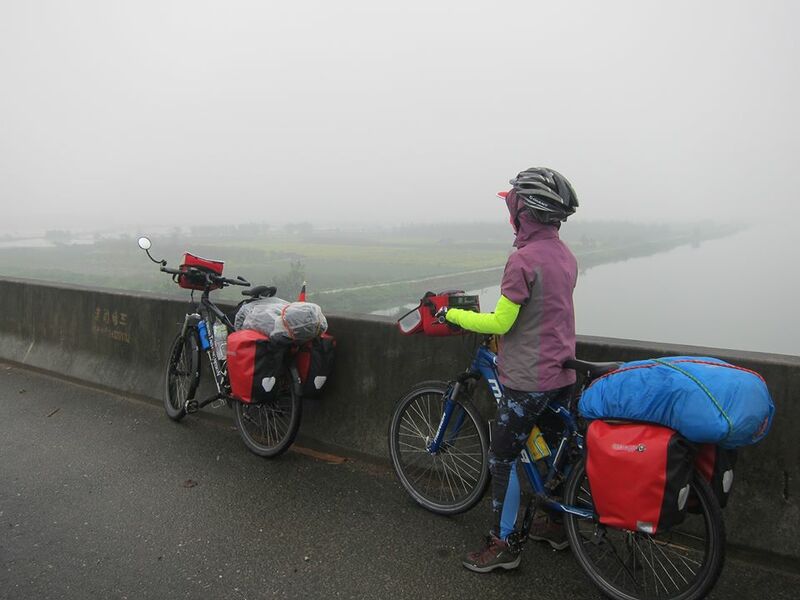 Our bicycles were leaned on the wall, secure enough as the crossing wasn’t too rough. 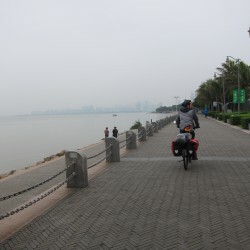 In Zhuhai, the same ultra-modernness as in Shenzhen awaited us along with generous bike lanes, everything being very clean. 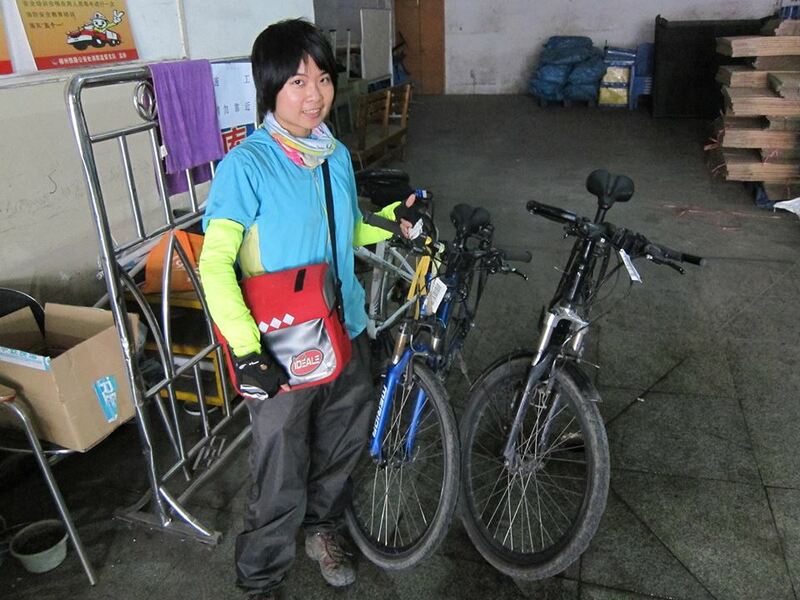 As we parked our bikes to go into a supermarket, Yuily overheard a woman frantically explaining to the police that her bicycle was stolen. Hmm, we decided to postpone the shopping. We arrived at our hosts place in a huge complex of guarded compounds and were able to take the bikes right up to their flat. 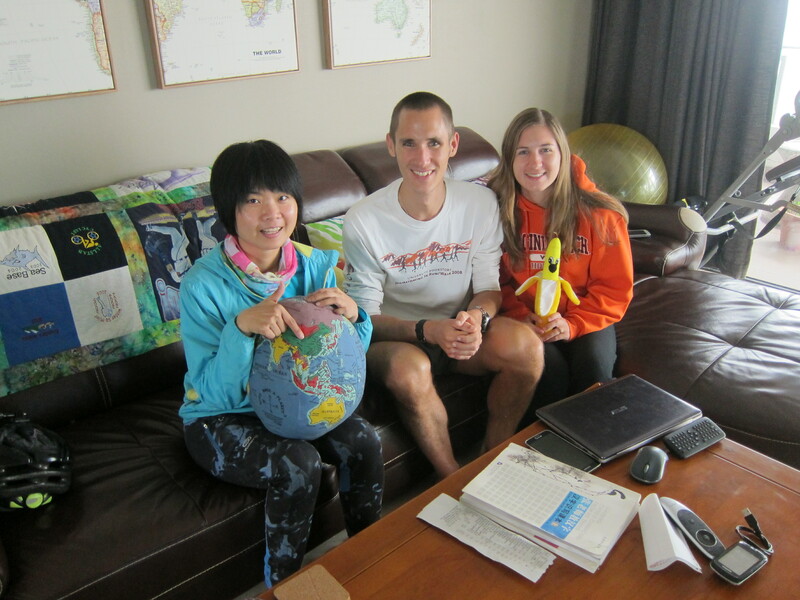 Justin and Cara, two expats living in Zhuhai, welcomed us with a home cooked dinner and awesome company. Since we had such a comfortable place to stay at, we were in no rush to get going. We enjoyed a nice breakfast with our hosts and packed slowly. It was after 11 by the time we went out, but we still had errands to do. We popped into a nearby supermarket to get some supplies. Unfortunately didn’t find any gas or strong duct tape, it would have to wait for later. I really tend to forget about these things easily, but Yuily is much better at remembering that kind of stuff which can be really important in a pinch. I tried to get a SIM card, but the stall would only give them to Chinese ID holders. The lady mentioned that official China Mobile stores can sell and register a SIM to any passport and kindly pointed out a nearby mall with such a store. Thanks to Yuily’s translating again, it would’ve been much harder for myself to figure this out. Said and done, in the mall I was able to get a SIM for RMB55 with 700MB of data. Note for traveling in China: You can get a SIM card as a foreigner, just not at 3rd party stores. 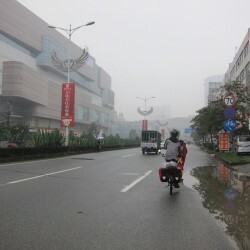 Now almost 3 pm, we were finally ready to get out of Zhuhai. 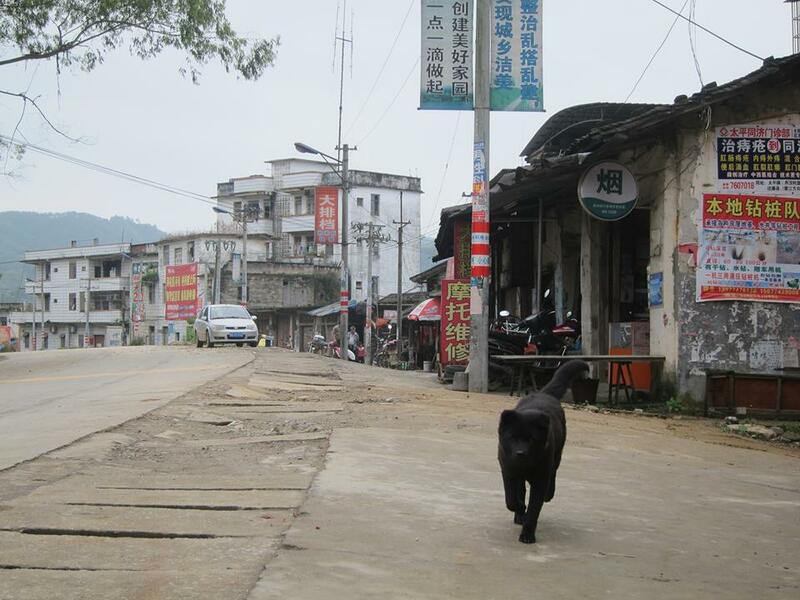 We followed a big highway for a while and slowly saw the roadside buildings go from super modern to crumbling, grey shacks. The wealth gap in China is huge and was hitting me right in the face here. 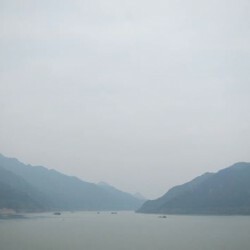 After crossing a huge bridge across one of the Pearl River delta arms, we took a smaller country road north and were able to see some river life. I underestimated the low density of shops with food so we consumed the snacks we bought in the supermarket earlier. Crossing the river again I suggested staying in a hotel, which Yuily agreed with. 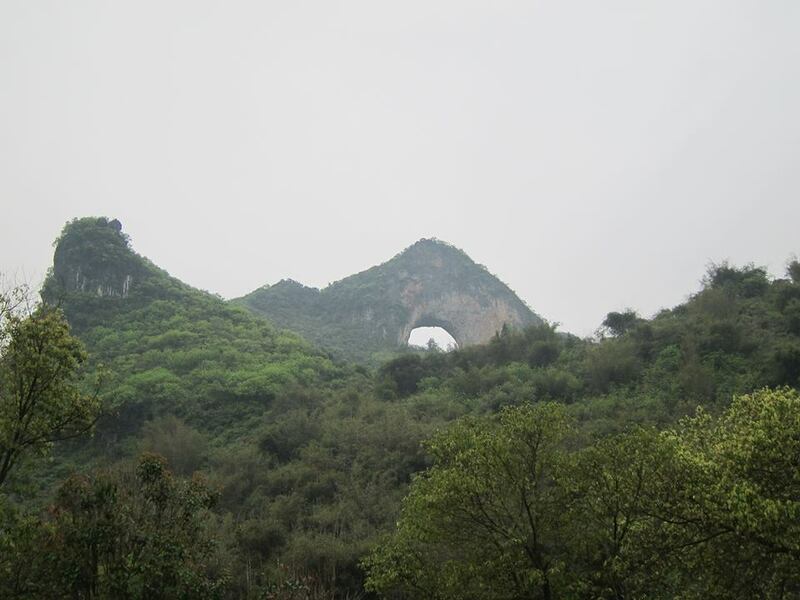 The much recommended Baidu Maps pinpointed to us perfectly. 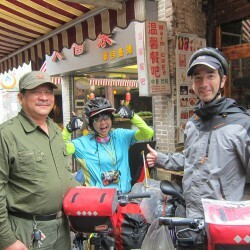 I was glad for Yuily to confirm the price while I guarded the bikes. RMB98 for a room attatched to a Karaoke bar was not too bad, as we safely parked the bikes in a storage room. 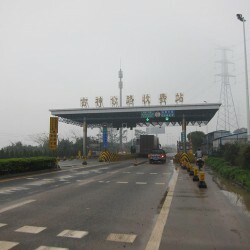 Crossing a pearl river arm. Not having any errands to do we got going at 8 am to put in our first full day of cycling. 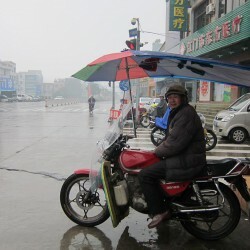 The weather was miserable, with a light spray rain all day, developing into downpours in the afternoon. 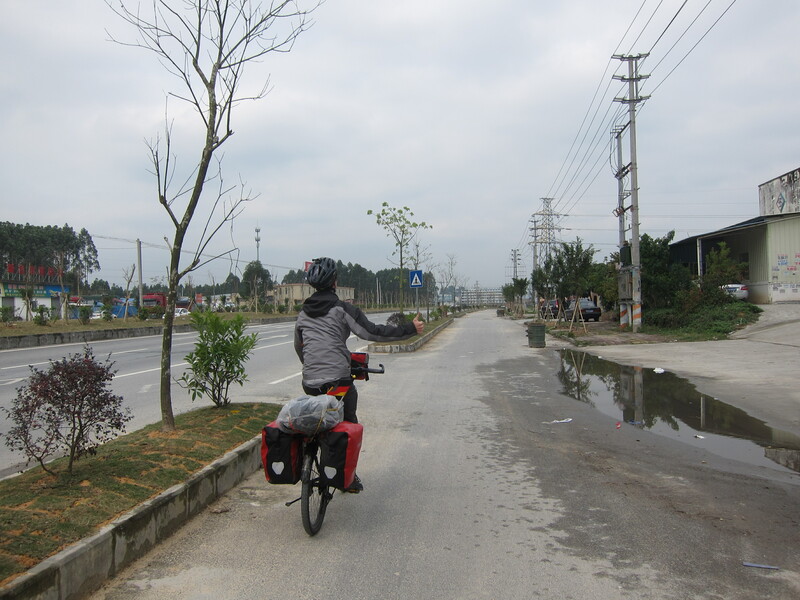 We followed what looked like a tertiary road on the map, but was still a dual carriageway including toll booths. However, the traffic was light and we had a shoulder. 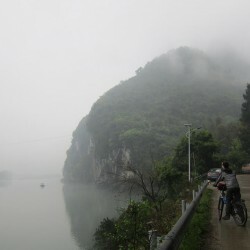 The misty rain obscured all views more than 300 m away and the cycling was mostly boring, with Yuily managing to nap away while cycling. I think it’s amazing that she can do that. 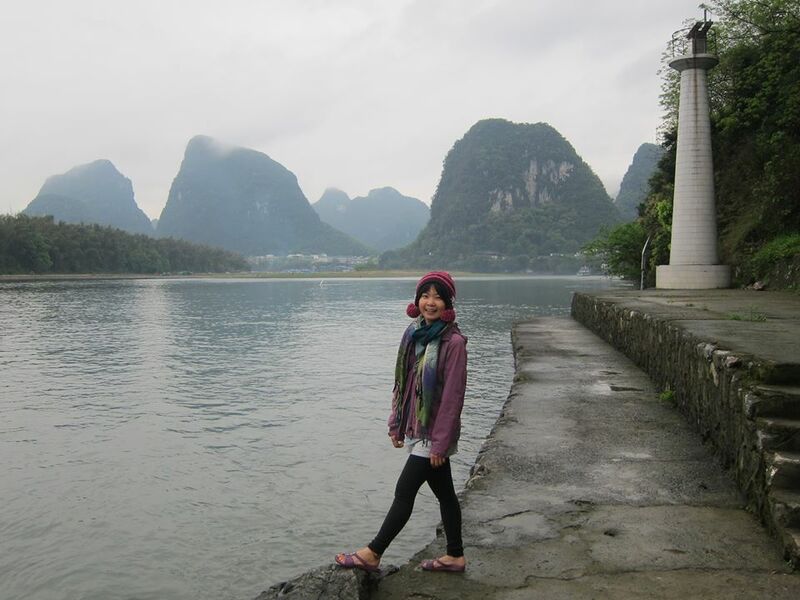 I was still enjoying everything, as it was really, really different compared to Taiwan or even Hong Kong. The rain increased in the afternoon and we had to hide out the strongest showers a couple of times. 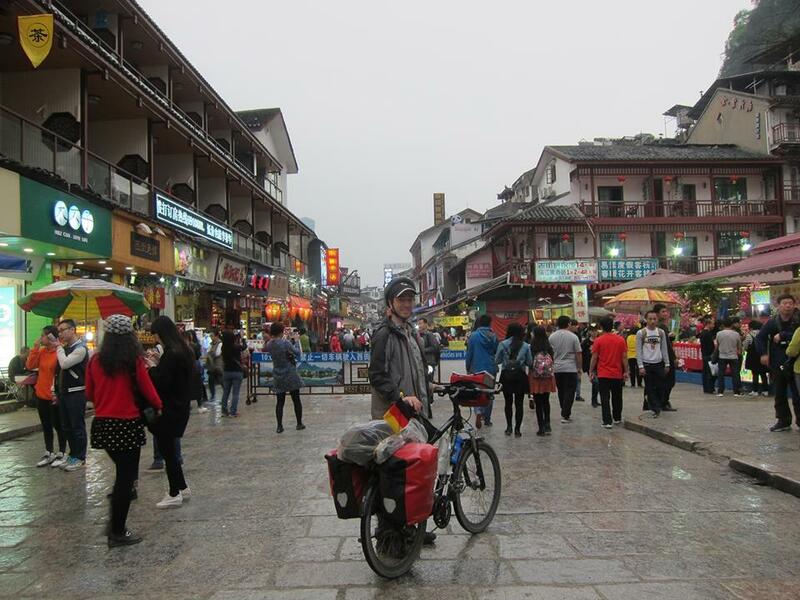 Out here I was also confronted with the stares that foreigners in China get. 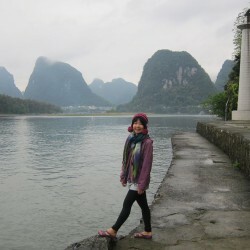 Since people were obviously curious about me, sometimes I smiled and said “Ni Hao”, to which they looked at me confused. People here seemed very cold, perhaps even more so than Europeans. Not something that bothered me though. We passed through a few towns and most of them were really, really ugly. Industrial suburbs with pollution-spewing factories precede what is either crumbling, faint houses or shiny but soulless apartment towers (commieblocks). Every town would have a massive mall somewhere that couldn’t be any more generic. 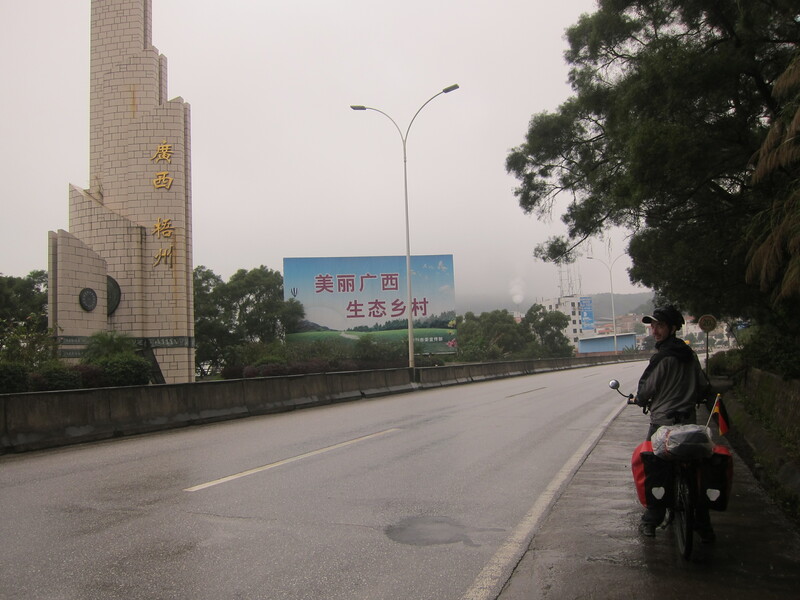 Out here, I was considering to stop as the rain came down in periods, so I asked Yuily about whether to end the day here or continue 17 km further to Heshan. She seemed content with the second option, which really impressed me considering how miserable the weather has been so far. 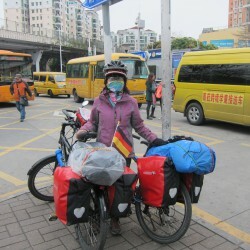 I appreciated her persevering considering my short visa time. 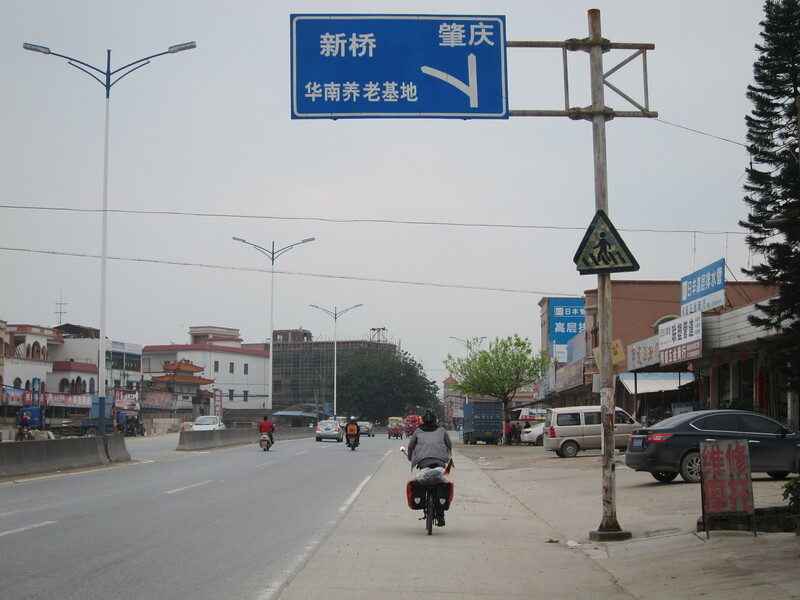 We set on to cross the last delta arm into the city of Heshan. The bridge actually had a sign not allowing bicycles, but since no one was checking and there wasn’t any alternative, I blatantly ignored it. 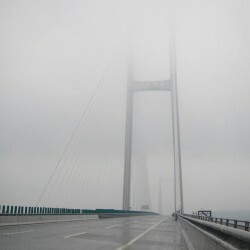 What followed behind the bridge was actually a limited access expressway. 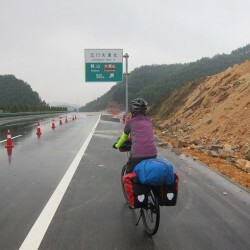 Cycling on regardless was a great choice, as the road cut straight through several hills and had barely any traffic on it. Imagine having your own expressway. 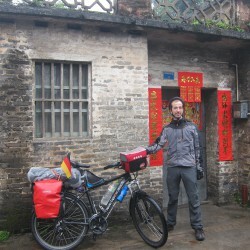 In Heshan I found a RMB60 guesthouse thanks to the trusty Baidu Maps and Yuilys negotiating. 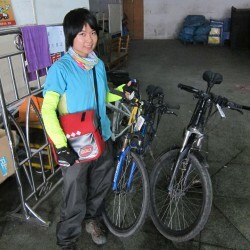 Yuily went to clean her bike as it was caked in grime and sand picked up from the road due to her lack of fenders. I felt sorry for her. Mine got away significantly better, but still required some cleaning in the morning. 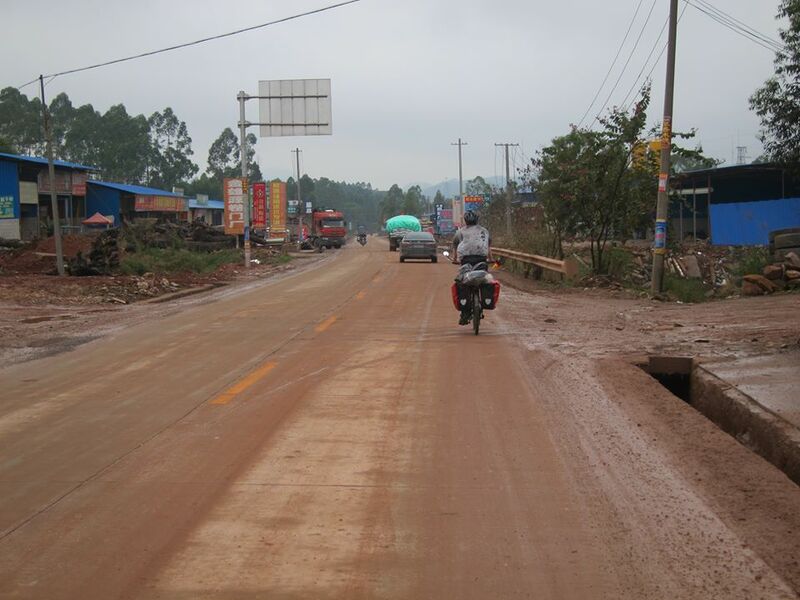 Roads here have a lot of sand on them. Onto an expressway. Smooth and easy. I woke up to sunshine in the window and knew it would be a nice day. Not getting started until 10 due to all the cleaning didn’t matter. Conveniently next to our guesthouse was a cheap eatery for breakfast. Chinese food was excellent so far and a whole world different from Taiwan, like just about everything else. 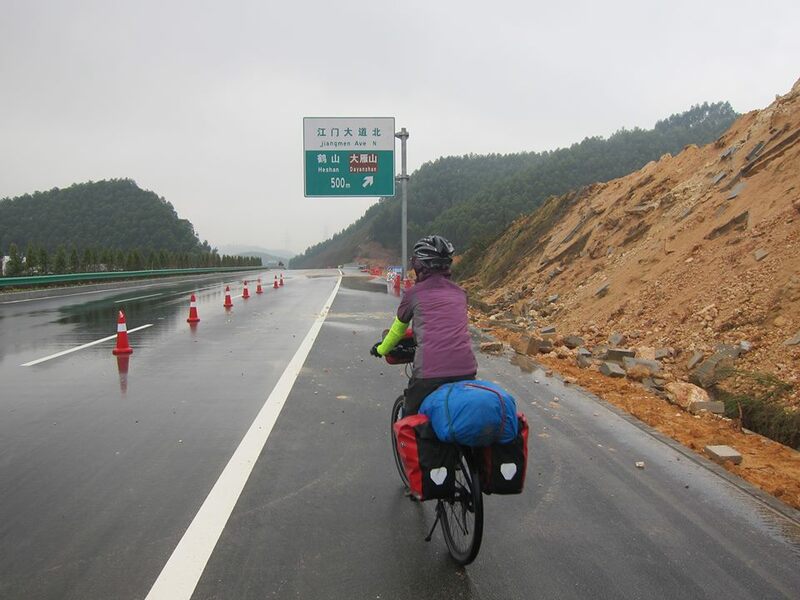 Out of Heshan we had cycle lanes and wide shoulders, the road gently going over rolling hills covered in secondary forest – I guess all forest was cut down in this region before and now they realized their mistake. The sun showed up again and again between the clouds as everything was pretty great. 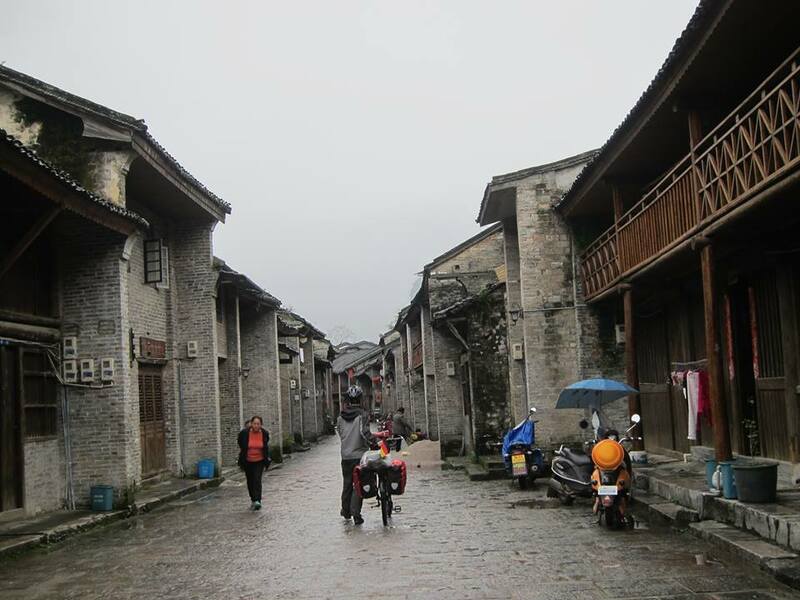 There were numerous villages along the road dotted with old style Chinese houses. 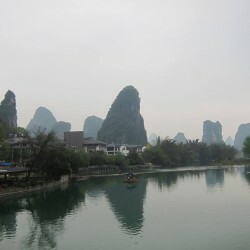 These blew my mind, they could’ve easily been 500 years old and looked just like I imagined historical China. Incredibly beautiful and scenic. They appeared every few km and it seemed like I would see a lot of them in the next days and weeks. People also turned to be a little better. While still mostly blankly staring at me, some managed to say a hello, to which I smiled and replied. It means a lot to me in a country where many people seem incredibly cold towards strangers. 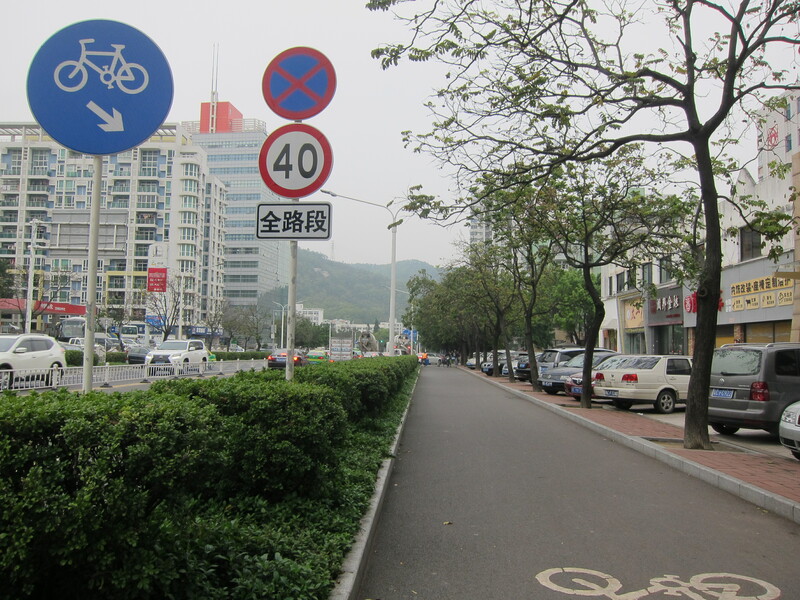 The cycling got less interesting as we reached more urbanized areas. 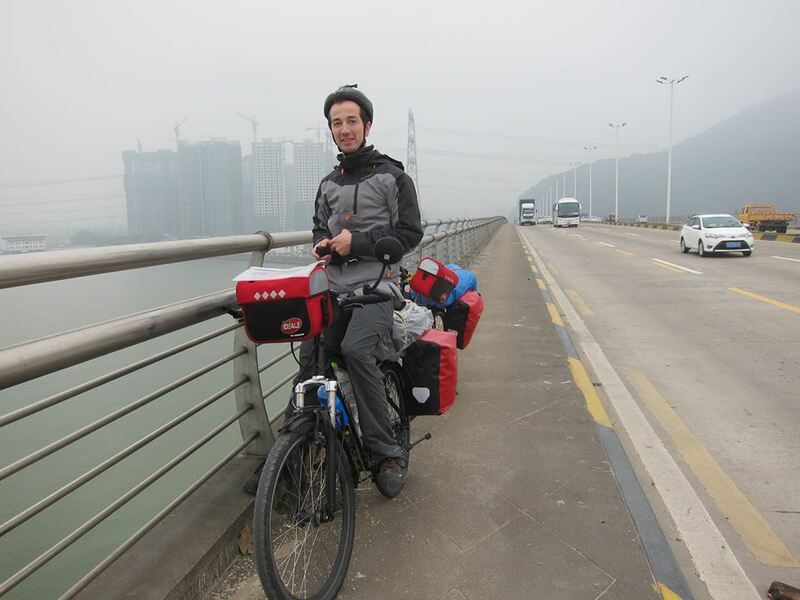 The final bridge across the Pearl River didn’t allow bicycles yet again, which we yet again ignored. The traffic was busy an there was no shoulder, which actually made the restriction seem justified this time. 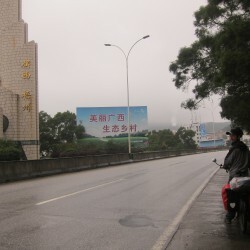 Making it out alive and rolling into Zhaoqing, with 3 million a “small” city by Chinese standards, Yuily noticed a guesthouse with an advertisement for RMB48 rooms. It was true and we checked in. Thanks to her again, I wouldn’t have noticed it! 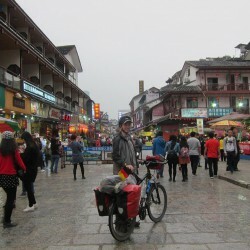 We had a cheap dinner followed by a big bottle of local RMB3 beer for me. 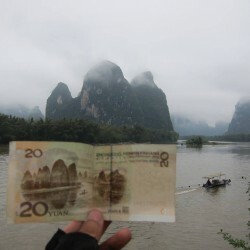 China is proving to be a cheap travel destination. 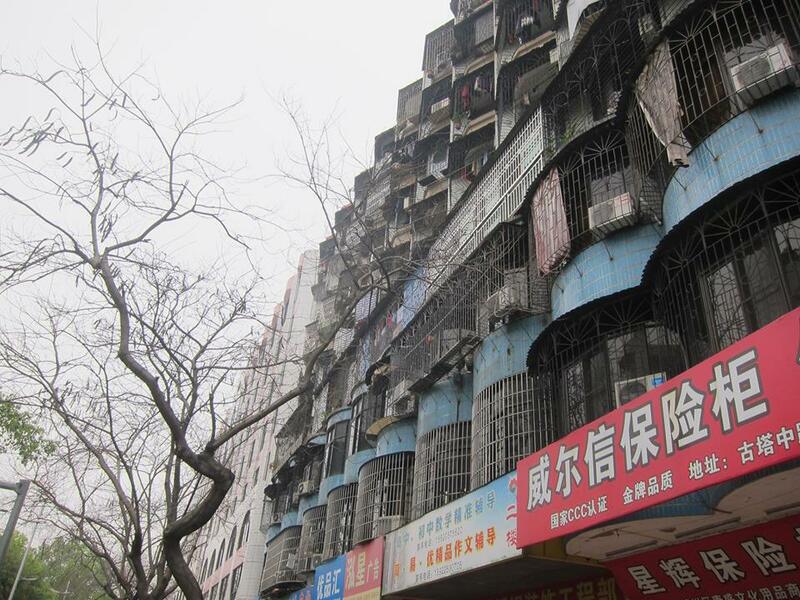 I just hope the people will become warmer and the cities less ugly now. 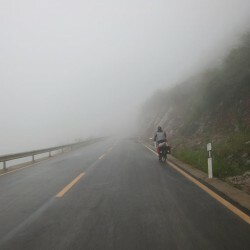 Today the weather was back to being foggy so visibility wasn’t too far. At least no rain. 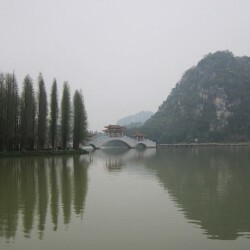 In the morning we went to see the city’s attraction: The park. 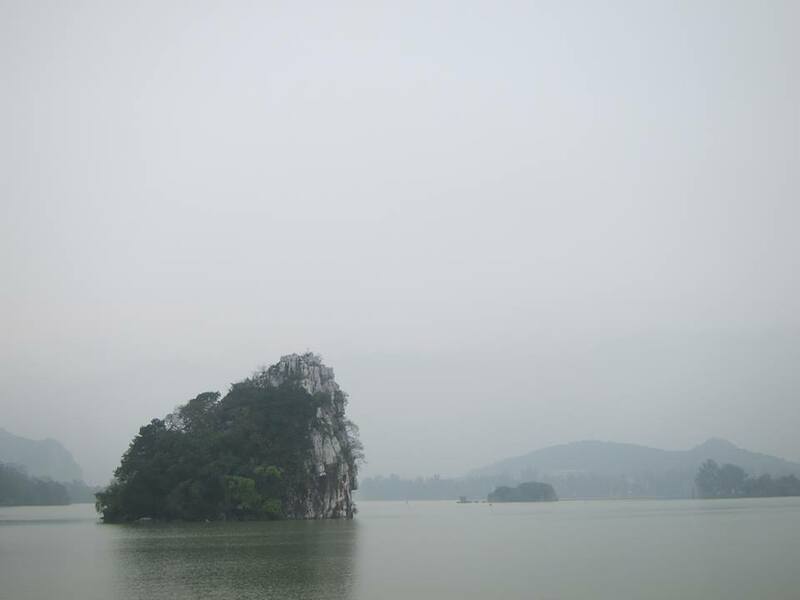 A collection of karst limestones were peeking out of a lake, left behind by a former bend of the pearl river. 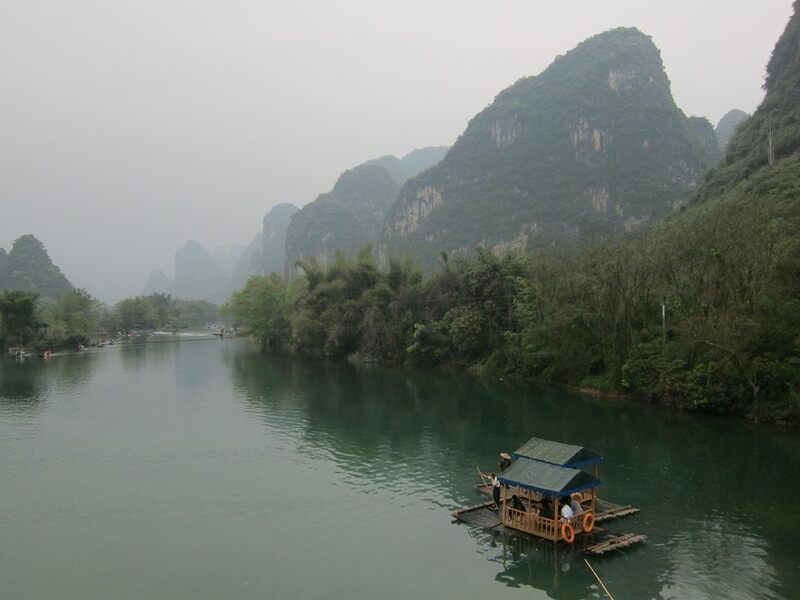 It was stunning, and gave me a little taste of what to expect in Guangxi province later. We followed nice bike trails around the lake for around 10 km before joining a new friend for the next few days, the G321 highway. 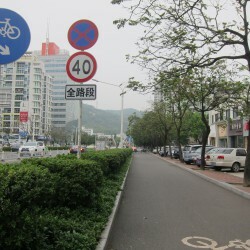 Roads designated with G are the highest class of road in China, and in the east most of them are expressways. This one wasn’t, and we were allowed to cycle on it. Not that there was any other choice anyway. It was better than expected. 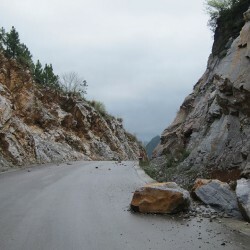 Even though the shoulder was mostly unusable due to sand and spiky stones on it, traffic was never too heavy and usually gave us plenty of passing space. 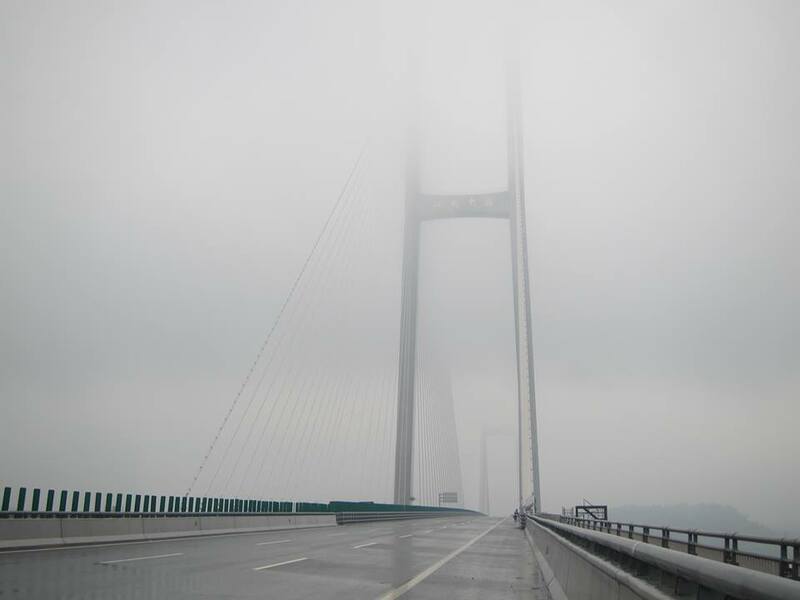 It was a boring road though – it followed the Pearl River, of which we couldn’t see much due to the barrier, and when we could it wasn’t a pretty sight anyways. 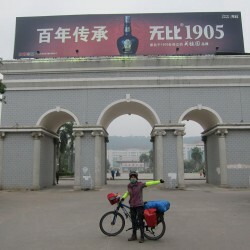 So we just kept pedaling and decided to attempt our first century in China, aiming for Deqing. 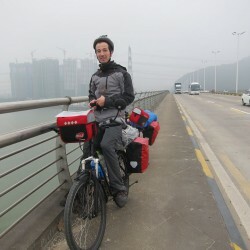 This boring, long distance cycles are made so much better though by having the company of Yuily. She would sing a childish, silly melody or make up a small song that is just cheering me up incredibly as I play along. We developed this habit of playing around like that while cycling around Taiwan and it will never be boring for me with her. I really appreciate her being with me on this trip. 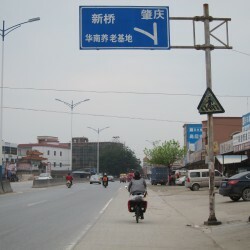 On the way we passed through some seriously ugly towns and Deqing was one of them. They were so depressing and run down it made them interesting again, in a dystopian kind of way. 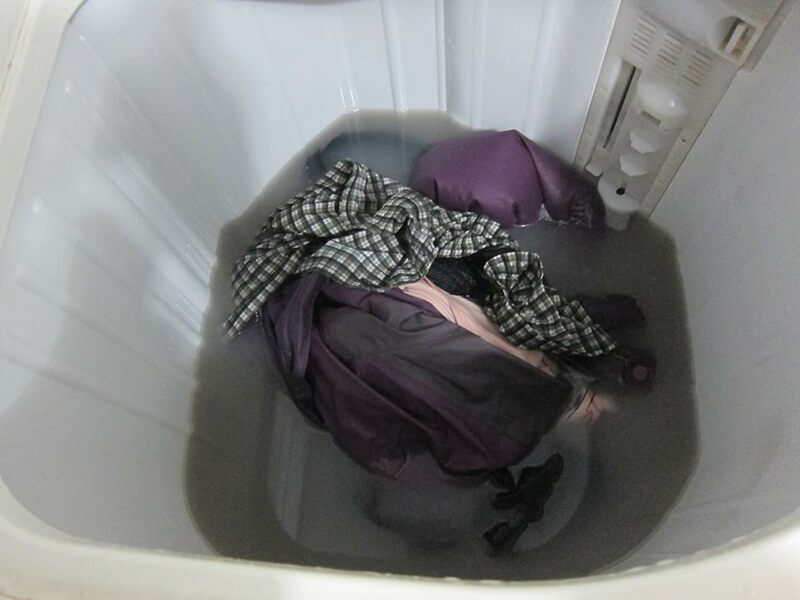 A cheap hotel of RMB60 was found via Baidu Maps and dinner had, where Yuily accidentally ordered a dish with really bitter vegetables instead of cucumber. Although, if it was just me, my food experience would be much more boring as I can only pronounce a handful of dishes right! 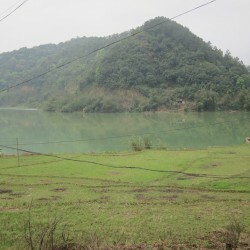 Deqing. 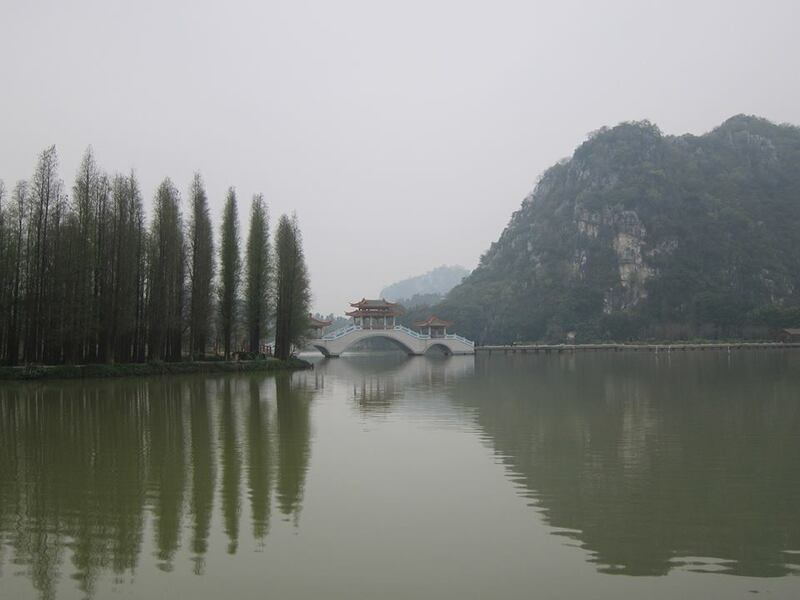 They called this “Triumph arc” in Chinese. Hmm. Rain was forecast for the morning and since I felt tired anyway I had a lie in. 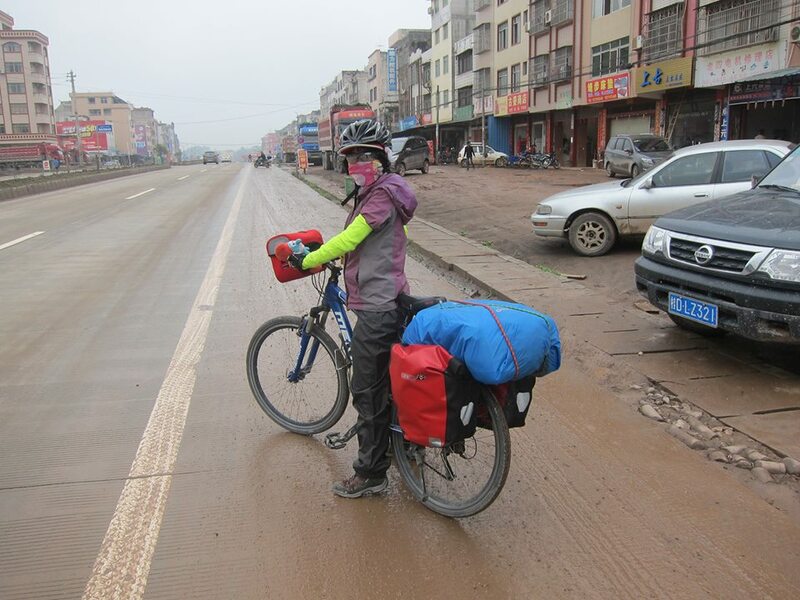 When I finally got up and had everything packed Yuily noticed her front tire being flat. It was a slow puncture from a metal shard picked up the day before, and it took some time to get out. I helped her as best as I could as we were surprised at the viciousness of this metal. It would be my turn soon I suspected. It was almost 12 when we were out on the G321 again after breakfast. But the weather was ok, overcast but dry, traffic calm and giving us space, and the road was smooth so we made excellent progress. There was a huge layer of grime and dirt on the shoulder so it was unusable – thankfully most traffic used the inner lane of the dual carriageway. 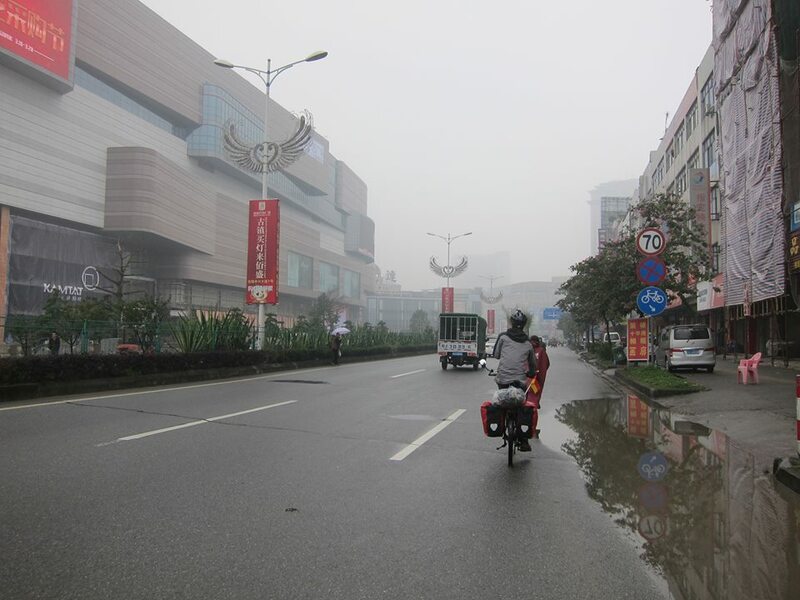 After lunch and a rest stop, where I saw the infamous Chinese toilets without privacy, drizzling rain started, ensuring that we would arrive wet and dirty in Wuzhou. 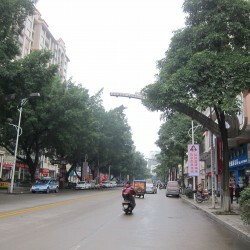 Thanks to Yuily’s keen eyes, a RMB60 hotel was found as soon as we rolled into the city. We enjoyed the cycling nonetheless. Cleaning all the grime off our bikes took a while and would be mostly futile as the lovely G321 turned into a single carriageway caked in the most mud yet. We still remained in the traffic lane most of the time, forcing the angrily honking traffic around us, as the shoulder was totally unusable. Again, Chinese drivers generally gave us plenty of space when passing. 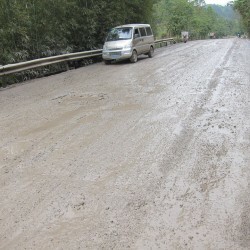 Just when the road started to dry, drizzling rain ensured it would get wet again. I also had my first encounter with someone stopping in front of me, happily asking to take a picture together. In the process, he picked up a hitchhiker. I have to remember that genuinely warm people like him are everywhere, no matter where you go. 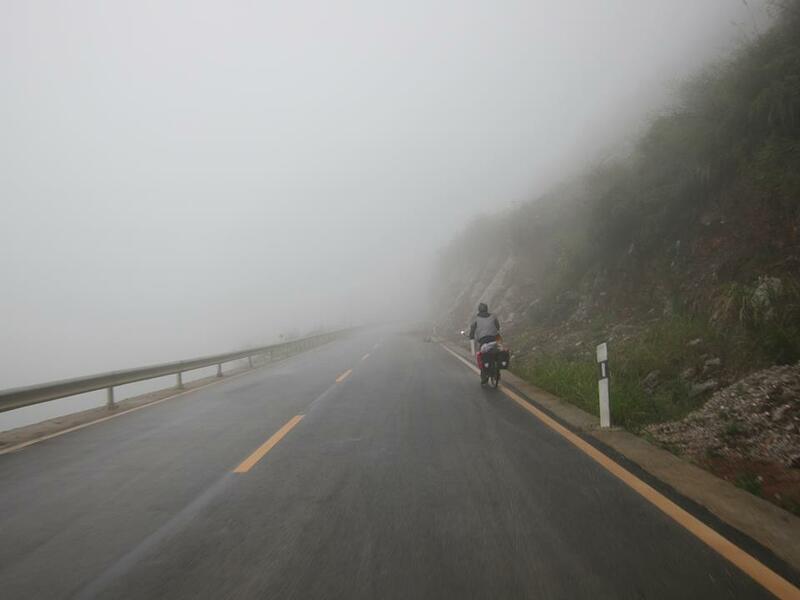 A slight navigation mistake cost us a few kilometers, and with the drizzle and fog getting stronger and the road going over rolling hills we would fall short of our target, Taiping, today. 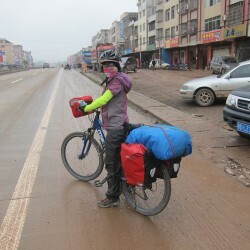 The trouble was that there were no structures for 26 km before there, so we cut our day short and decided to stay in Mengjiang for the night. 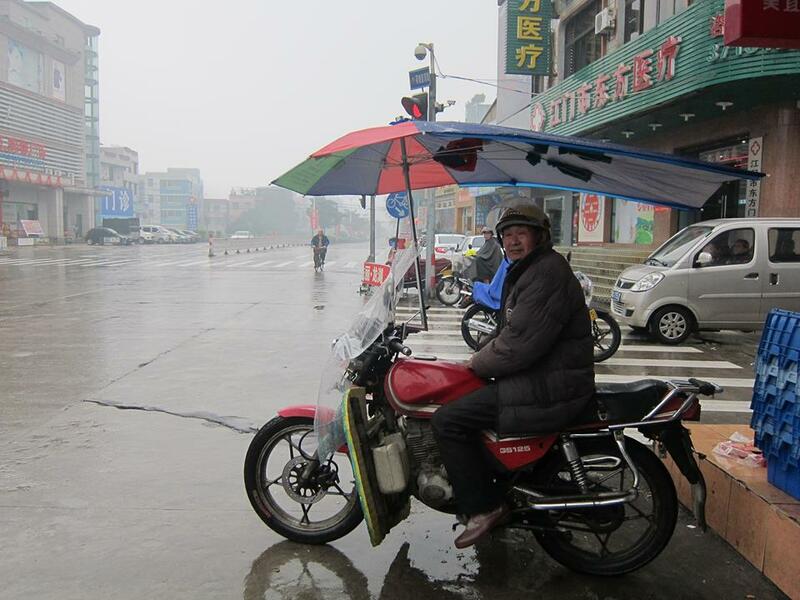 I felt sorry for my mistake and apologized, but despite this and all the rain, Yuily was ok with everything. I really loved this fact about her: She is not afraid to get dirty and never gives up easily. There are many times I thought that any normal girl would cry to stop and go to a hotel, but not her. I cherished being with her. It was a small town, even by western standards, so I was quite the sight here. We checked a few hotels and Yuily managed to score a deal with the biggest room as they were all similar in price (RMB70). The woman at check-in, upon learning that we are both foreigners, nervously asked Yuily if we had any identification in Chinese, and was relieved to hear that her Taiwan pass is in Chinese. I heard many tales of foreigners being refused at Chinese hotels before, and receptionists not being able to read foreign passports to enter the data with a language barrier might be one of the biggest reasons! With my abysmal Mandarin, this hotel would’ve probably ended in a refusal for me if I was by myself, but thanks to Yuily once again! We got out of the small town reasonably early for our standards and immediately began climbing a hill. 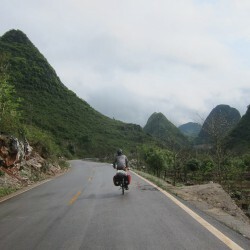 We were turning away from the Pearl River the last time, entering the hills of Guangxi. It actually didn’t rain and remained dry all day, while most of the fog cleared so we could actually see some of the landscape. 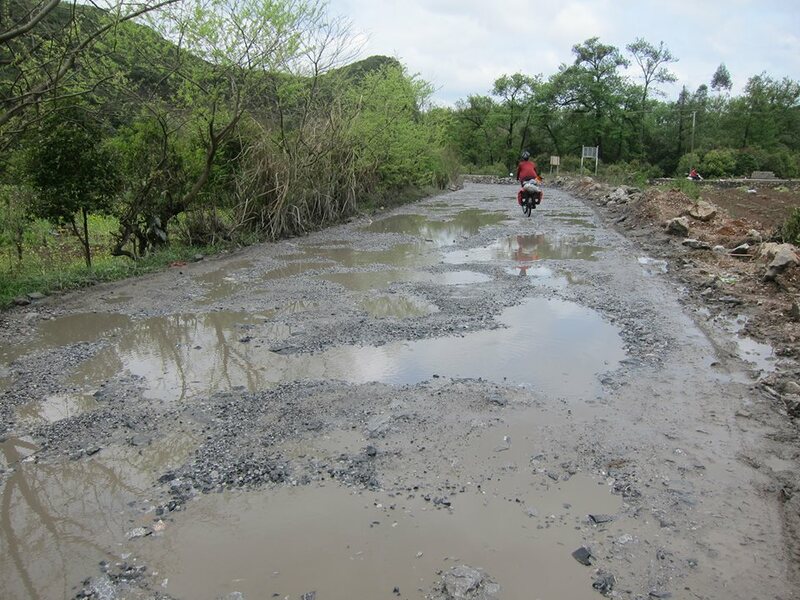 The first few km were still very muddy, but the road soon became cleaner and a pleasure to cycle on, despite relentless hills. 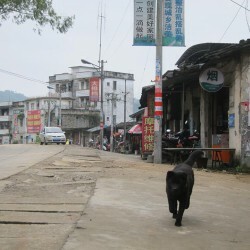 We stopped in a village to have lunch, where the residents all spoke a language completely different from Chinese. I could only assume they were Zhuang, an ethnicity related to Thai people, Chinas biggest minority, who mostly live in this province. The road being clean and dry now, we stopped at a gas station to spray off some dirt. 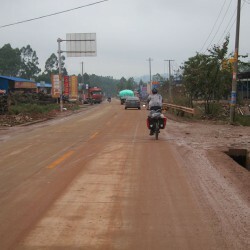 Soon after however, we entered a 10 km long roadworks section. 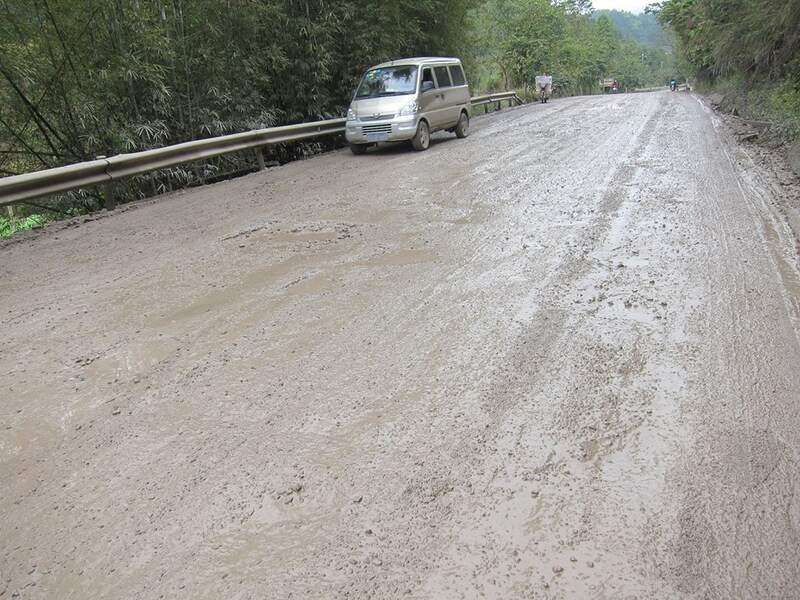 I read a lot about how the road conditions become an apocalyptic, muddy mess when Chinese decide to work on their roads, and here we were going to experience it. It wasn’t pretty. Our bikes were rattled to bits and got painted with brown clay. I was complaining a lot, but Yuily once again stayed strong, persevered and told me to stop nagging. She is very impressive in such situations. 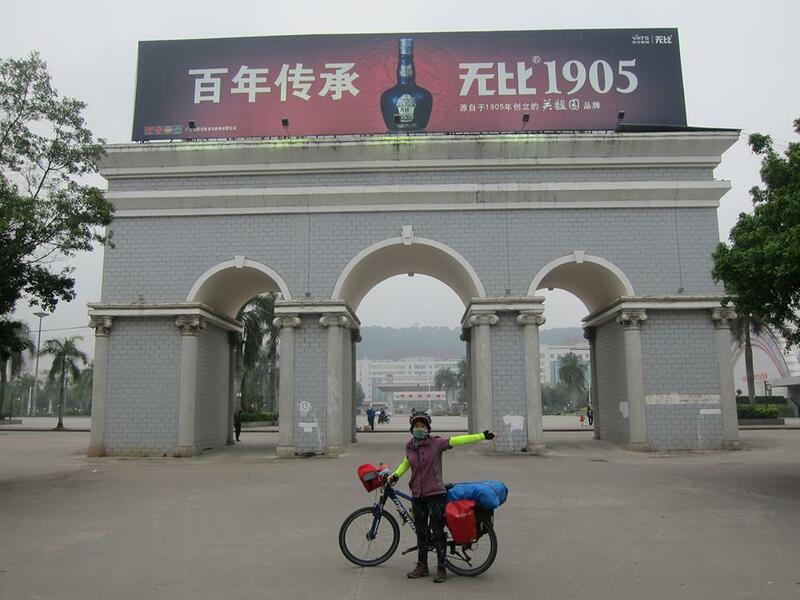 After the roadworks I was still having hope of pulling another century and make it to Mengshan after dark. I mistook the town on the map unfortunately so we had 10 km further then thought. Some more hills in between made our legs beg for mercy but we made it. After being refused for being foreigners for the first time at a hotel we tried, we quickly found another one for just RMB40. 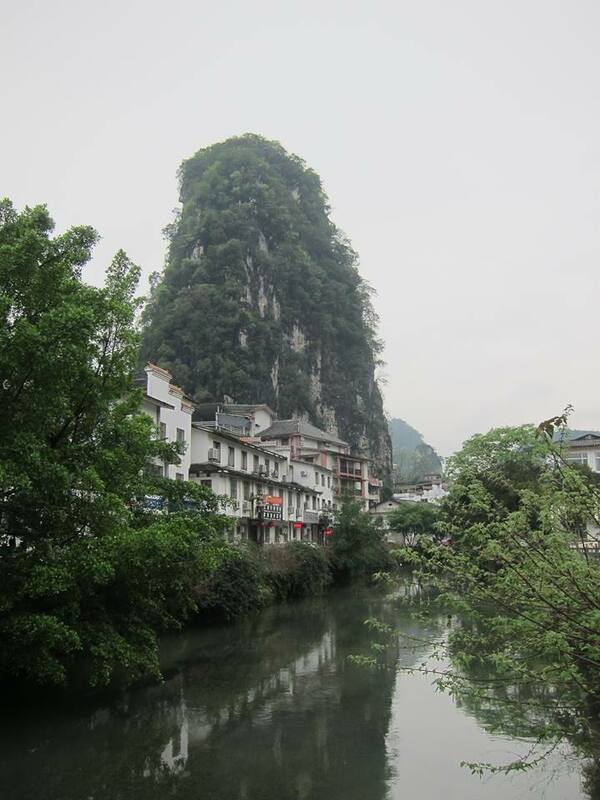 Our excellent distance put us just 80 km from Yangshuo, a tourist town where we planned a rest day. I dragged myself out of bed for a final push. 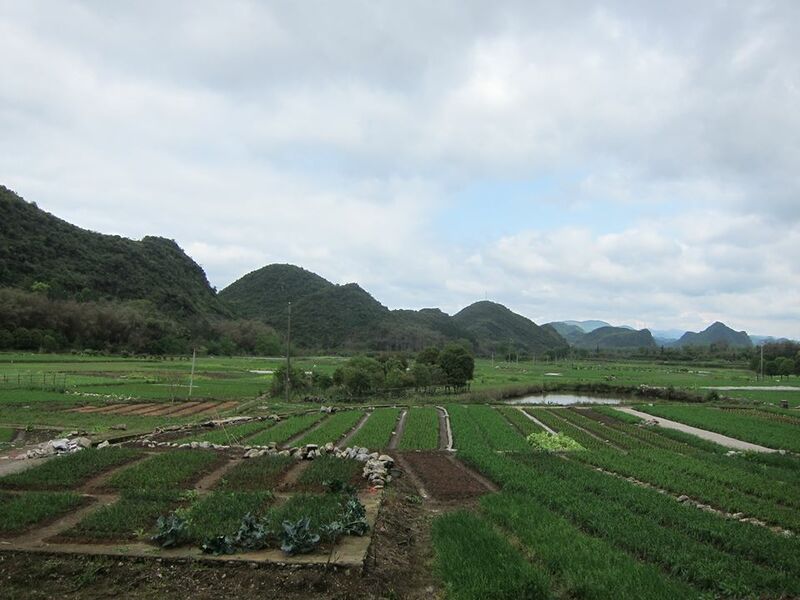 It seemed like it would be another dry day and I knew that for most of it we would see the famous karst scenery. We were excited to see it! It was a slow start and my legs complained the whole way. I guess 9 straight days of doing over 70 km each left their mark, but also probably my knowledge of an upcoming rest. 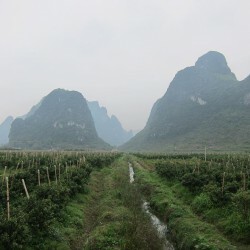 I couldn’t focus on it anyway as just after 25 km we saw the first karst mountain. And then another one. And another. And a whole lot more. 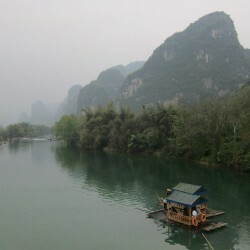 It was amazing – one of those sceneries you have to see in life. 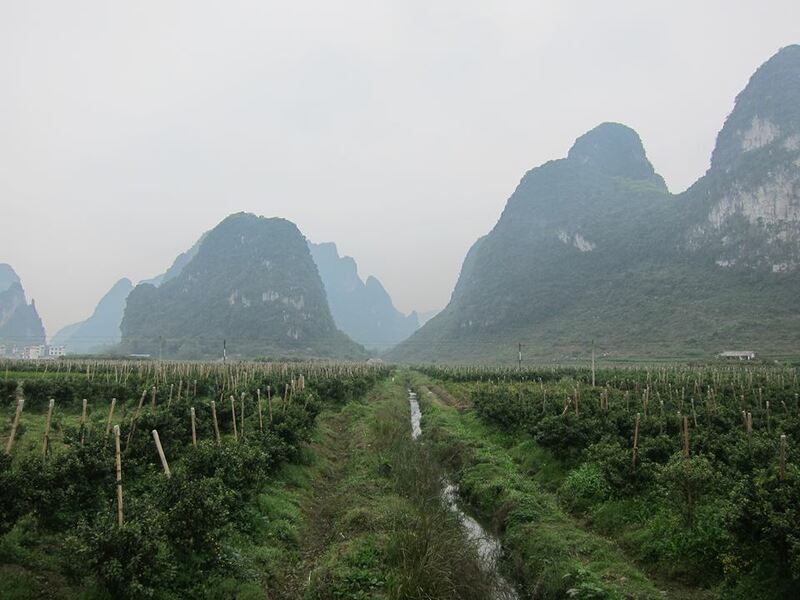 We rolled into Yangshuo and it immediately became obvious that this is another world. Tourists, mostly domestic ones, were everywhere, there was English signage and touts tried to get us on tours. As we pushed our bikes through the pedestrian area I even saw several German food places. 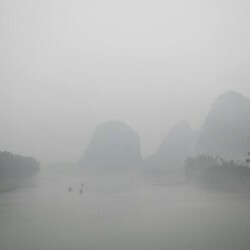 Were we still in China? 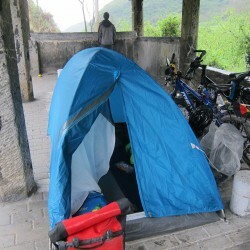 We found a hostel called Monkey Janes at RMB25 per person, which also happily provided a secure place for our bikes. 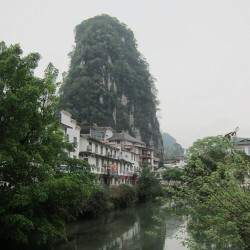 A lot of the things in Yangshuo reminded me of the tourist towns in South East Asia – it was truly its Chinese offshoot. Later that evening we joined a crowd on the rooftop bar of the hostel and had a good time before crashing out. A long sleep followed, after which we wanted to enjoy a leisurely cycle through the countryside. 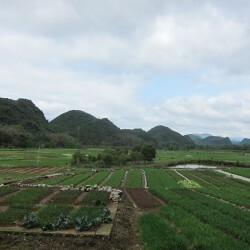 Breakfast was a problem as everything in Yangshuo is twice as expensive and less tasty than elsewhere in China, so we attempted to get something out of town. 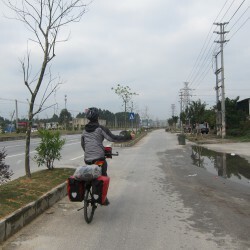 After cycling for more than an hour and still no food in sight, we stopped at an expensive riverside restaurant where a plate of fried rice went for RMB18. Ouch, lesson learned. One positive was that they had one kind of gas can that could feed our stove and I bought one of them so we finally had everything necessary for camping. 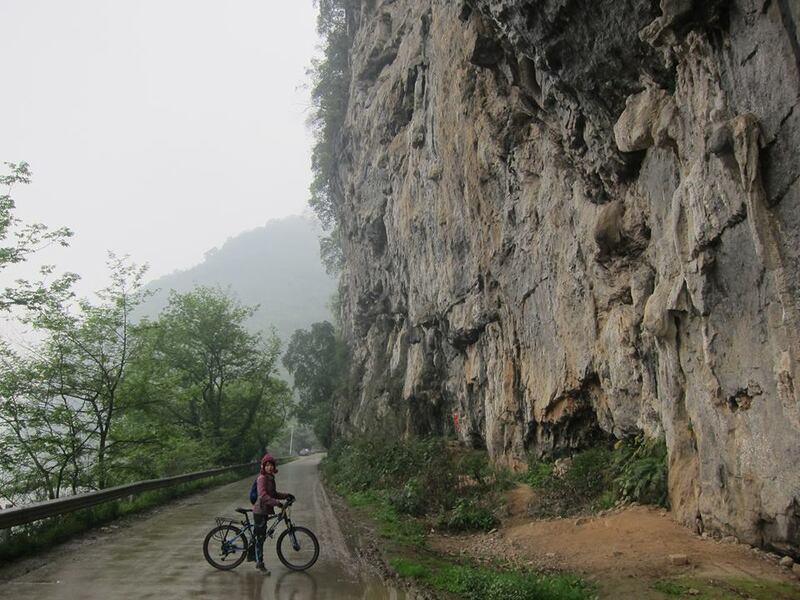 The day was very rainy later and we saw almost nothing of the scenery. Cycling in the rain, this was not such a nice rest day. 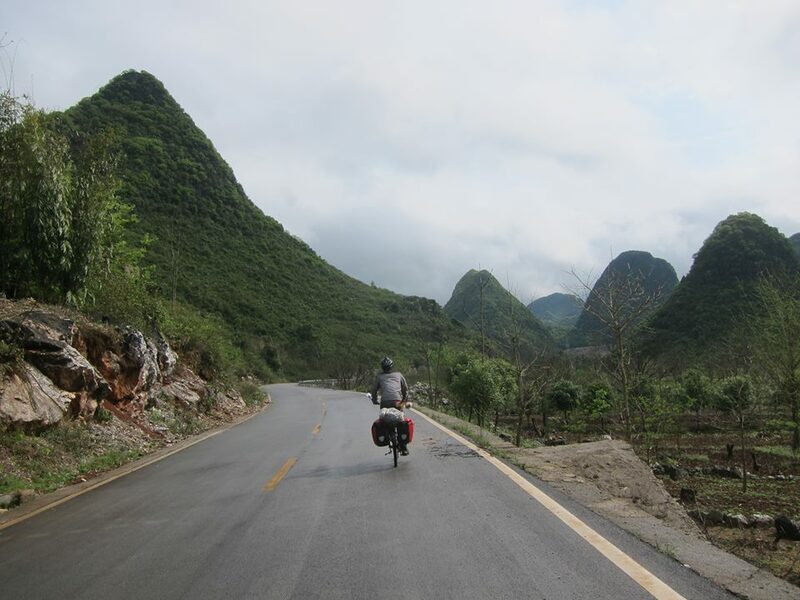 Due to the region being touristy, no one stared at me in the villages we cycled through. Later on I was at least able to do some blogging work. 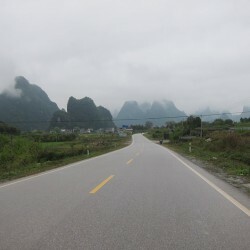 We planned to take backcountry roads to Guilin through karst scenery, so this route would take us two days instead of one on the main highway. 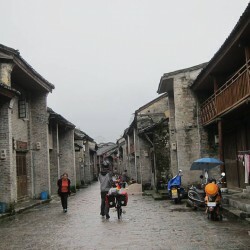 It also meant that we could visit the old town of Xinping on the way. After some quick 30 km we were there. It did look very cool, although not old as most of the houses were rebuild or restored. 30 years of western tourism also left the place littered with cafes, pizza restaurants and hostels. We still enjoyed it and raised a few eyebrows with our touring bikes, people wanting to take pictures with us. 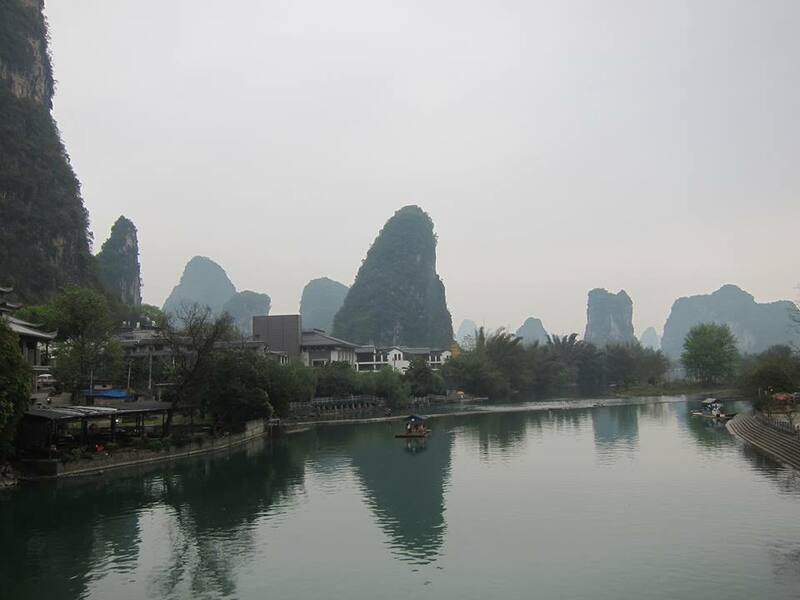 The karst around here was spectacular, even though it was still very cloudy. 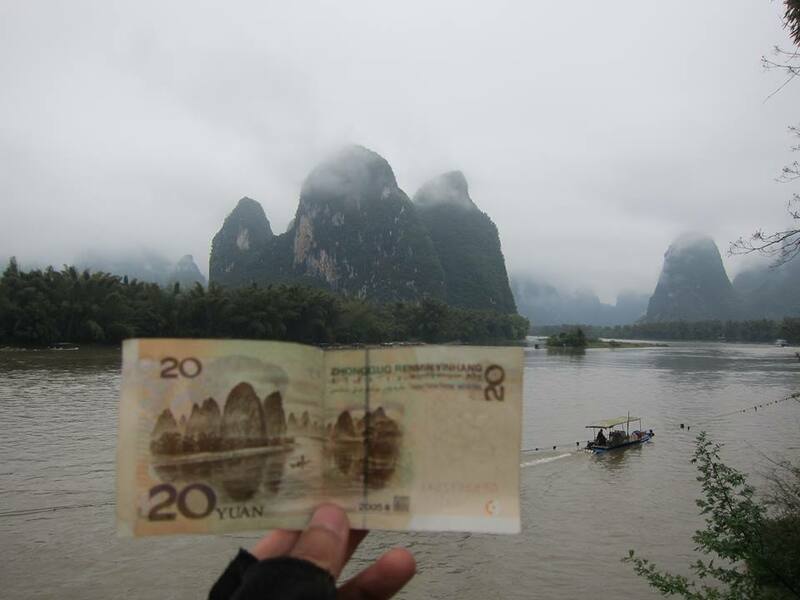 It was even used as a motive for the RMB20 banknote. 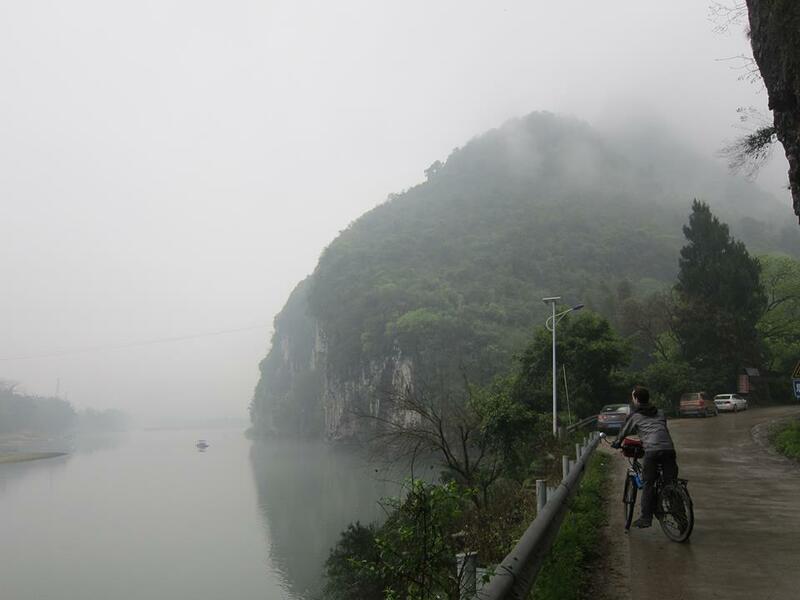 We cycled along the river until a place where you could only continue by boat. I read about this riverside section being a hiking trail, but now it was a road and a bus terminal was being built at the end of it. 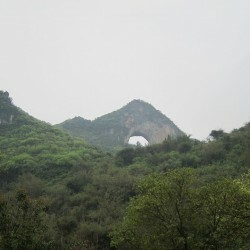 It seemed like the Chinese didn’t really understand the concept of hiking for pleasure. 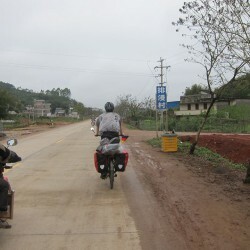 We backtracked and turned towards the X097, a country road leading us towards Guilin. 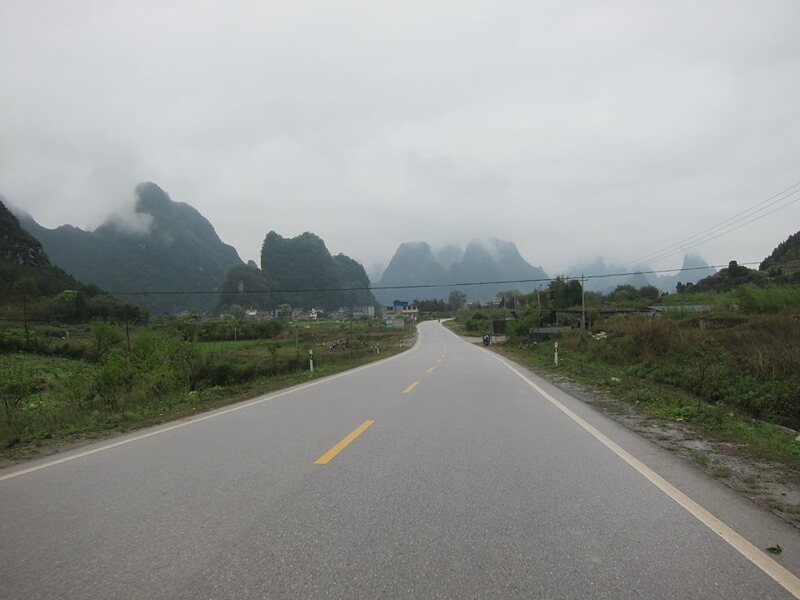 It was great – a mostly good, smooth road with little to no traffic, leading through a mountainous karst landscape, littered with small but well-off farmer villages. There was climbing, but we just powered up the hills without much exhaustion. 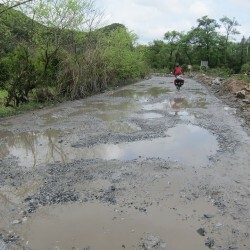 Occasionally the road went bad, but never for more than a few hundred meters. 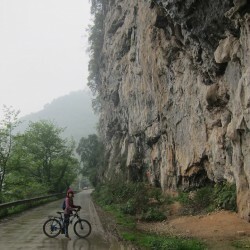 This road was carved into the hills without much afterthought. 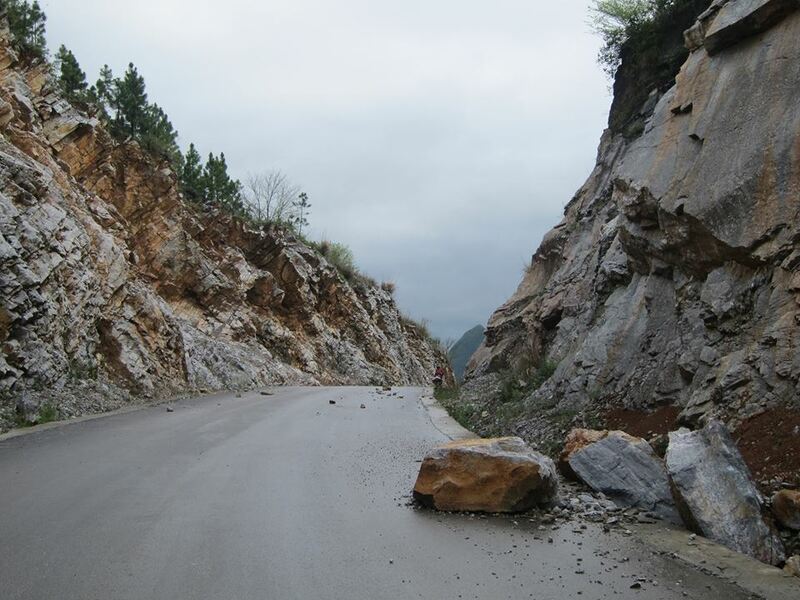 There were numerous landslides and rocks dropped on the road due to unsecured cliffs left over from construction. Usually these rocks would just be pushed on the side without any securing. 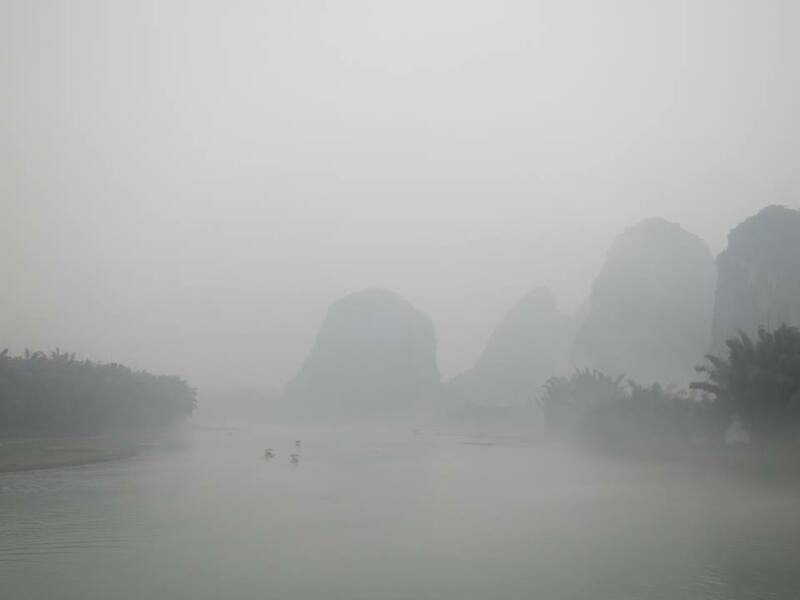 We could really see small negative effects of China’s “Growth no matter what” policy. 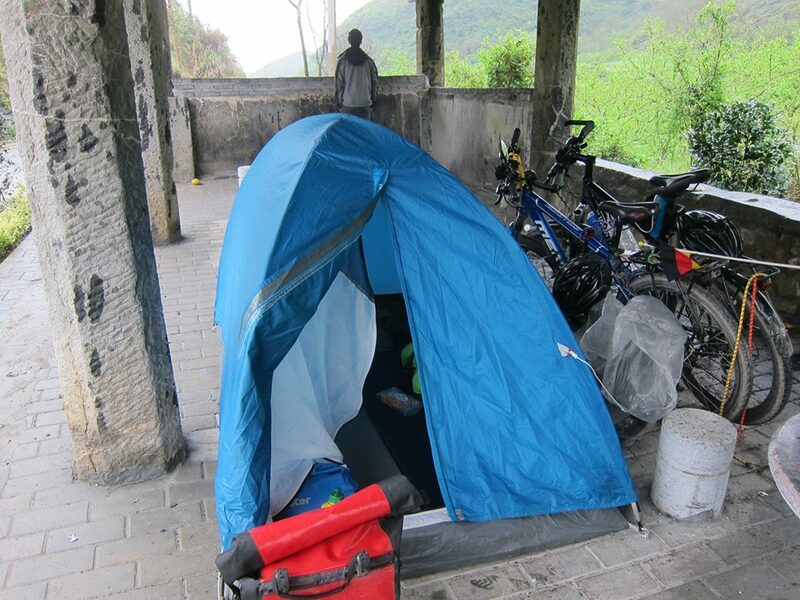 We chose to make our first wild camp of the trip and just after the 70 km mark a public pavilion appeared on the roadside. 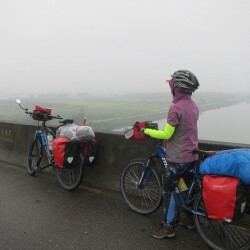 We decided to camp below it as it just started to rain – we would be highly visible from the road, but the low traffic, consisting of local farmers, meant that this was not a big issue. 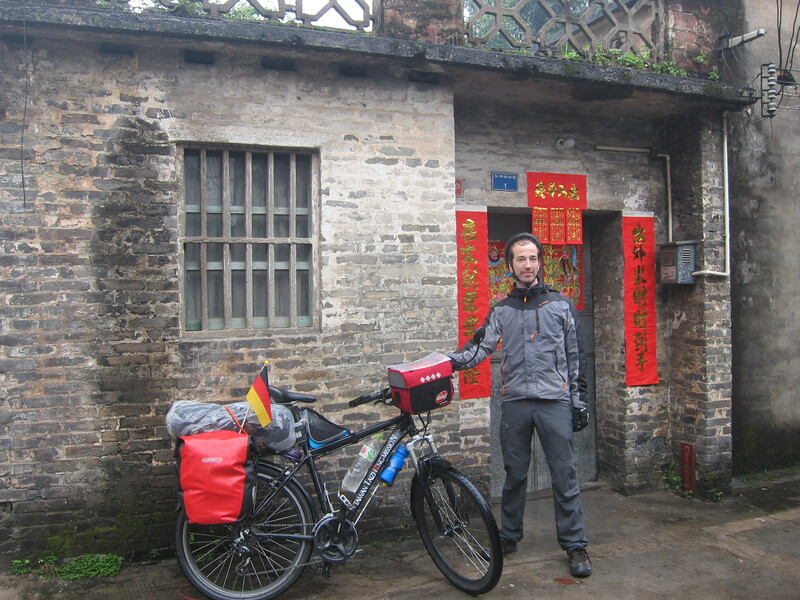 This guy toured by bicycle around China, too, even though his belly doesn’t suggest that now. Thunderstorms raging on through the night meant a very inconsistent sleep and we woke up rather late for camping. Not such a bad thing as it was still raining when we packed up as we were really glad for the pavilion shelter. We got going as soon as it stopped and soon after enjoyed some sunshine! 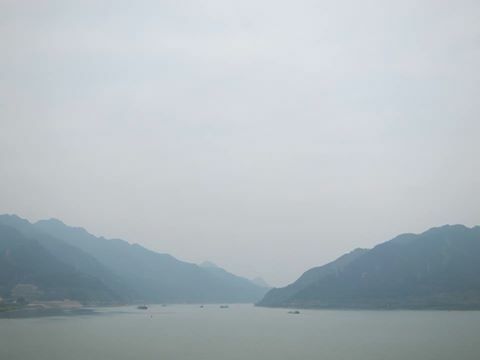 The first time since we arrived in China, we could actually enjoy the sun. 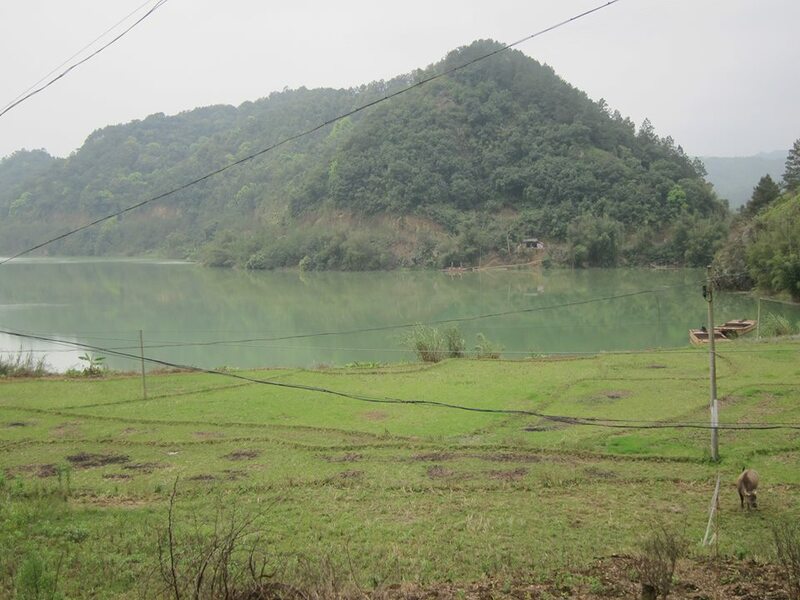 The landscape became even more spectacular as we could now see how green everything was. 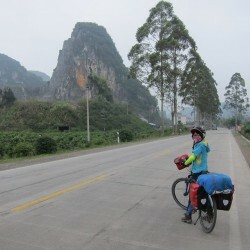 We enjoyed cycling on this country road and soon after bicycle lanes as we came closer to Guilin. This lane was soon filled with electric scooters when we arrived at the train station. 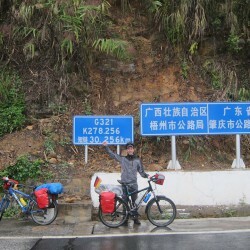 With that, cycling this part of China was over as we bought train tickets to Kunming. 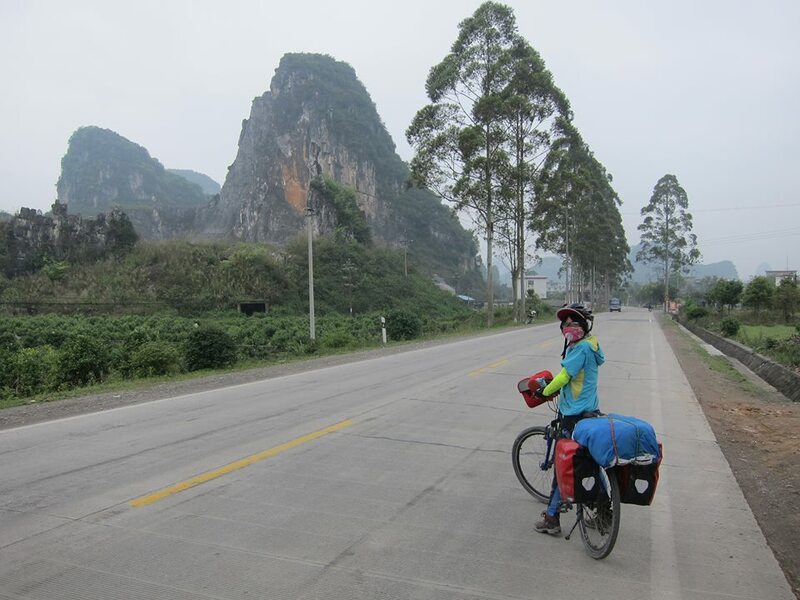 We would’ve loved to cycle it all, but visa constrains meant it was impossible to cross China without cheating a little bit. Our tickets were for the next day, a 21 hour journey on a hard seat for RMB152.5 each, being the budget travelers we are. 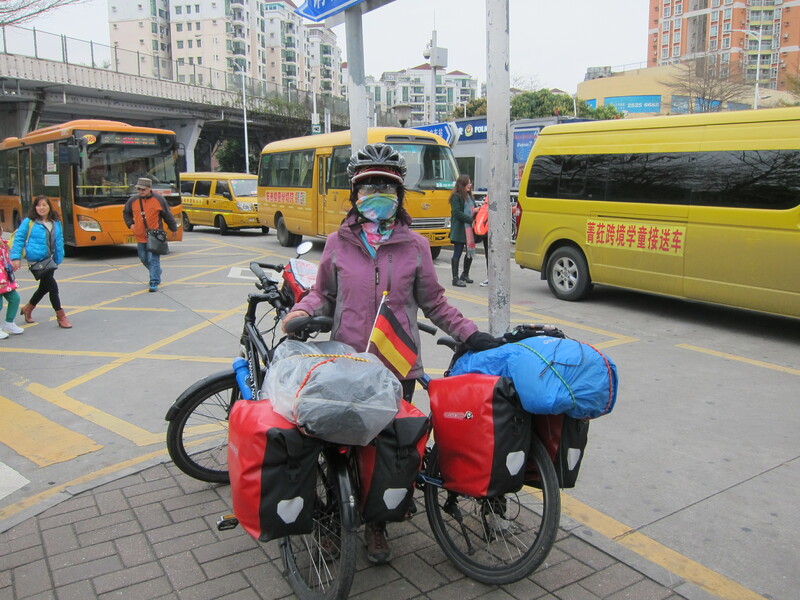 The bicycles were checked in the same day already, as they had to be consigned luggage and would be shipped on a separate freight train, hopefully arriving undamaged around the same time. 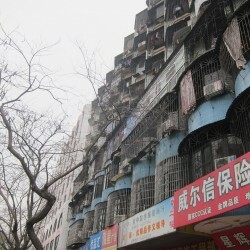 We found a RMB25 hostel close to the station to spend the night.